On 1st July 2013 Croatia will become 28th member of the European Union. While visiting our shop, passengers may notice - our prices are still very affordable and now passengers travelling within EU will be entitled to buy goods in greater quantities. So, from 1st July onwards travelers within EU are able to take the advantage of carrying home from their vacation up to 800 cigarettes (4 boxes), 200 cigars, 1 kg tobacco, 10 l of high-proof spirits, 60l of wine etc. For passengers traveling to non-EU destinations, the conditions concerning airport shopping will remain unchanged after Croatia accedes to the EU. Our shops are packed with well known international brands at very attractive prices. In our specially arranged section you may find products that our passengers love to buy and are authentic for this area, such as famous Croatian wines, various Croatian delicacies , virgin olive oil, „Croata“ silk ties, Dalmatian souvenirs etc. Prices are shown in €, but you may pay in all currencies and with all credit cards. 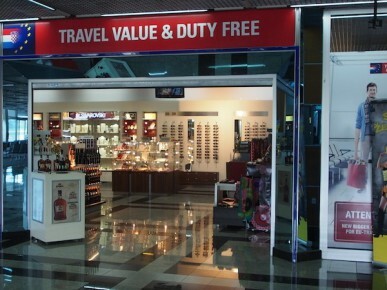 Take advantage of shopping at Split Airport.